In March 2010, I announced that we were in the process of developing a strategic plan for research training, and I asked for your input. We heard from more than 300 stakeholders, who included university faculty and administrators, graduate students and postdocs, representatives from professional societies and individuals from government and industry. We also received input from our Advisory Council at its meeting last week. Research training is a responsibility shared by NIH, academic institutions, faculty and trainees. Research training focuses on student development, not simply selection of talent. Breadth and flexibility enable research training to keep pace with the opportunities and demands of contemporary science and provide the foundation for a variety of scientific career paths. Diversity is an indispensable component of research training excellence, and it must be advanced across the entire research enterprise. We’ve posted the draft training strategic plan for public comment. I invite you to read the plan and give us your input. Between now and February 15, you may submit your comments anonymously through our online form. The Feedback Loop has gotten attention for its contributions to increasing communication between the scientific community and NIGMS staff. Now, the NIH Deputy Director for Extramural Research, Sally Rockey, has launched a new blog, called Rock Talk. It will be a forum for discussing NIH funding policies and processes and how they affect the extramural community. These posts will complement the NIH Extramural Nexus, which is more news-oriented. Both the blog and the Nexus offer subscription options. The blog is off to a lively start with a discussion of NIH’s family-friendly policies. I hope you will check it out. NIH recently launched a new site for communication with the scientific community, http://feedback.nih.gov/. The site has already been quite active, since it requests input on a proposed National Center for Advancing Translational Sciences (NCATS) and a proposed institute focused on substance use, abuse and addiction research. Of particular interest may be a recent post on a “straw model” regarding where current National Center for Research Resources (NCRR) programs might end up if they are redistributed as a result of the formation of NCATS. In this model, some NCRR programs would be transferred to NIGMS. An even more recent post provides information about open conference calls for grantees and others who are interested in NCRR programs to discuss the straw model. These calls will be held today through Friday. If you have an interest in these rapidly moving activities, the NIH Feedback site is a good place to find updates and to submit your thoughts. Over the course of its 10-year existence, the Protein Structure Initiative has supported the development of new technologies and methods that improve the throughput of protein structure determination. Many of them apply to the production of purified proteins for functional and structural studies, and you don’t need access to major research centers to use them. 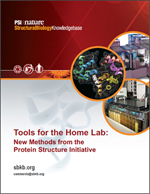 To help you take advantage of these resources, the PSI Structural Biology Knowledgebase offers a series of short articles summarizing tools and technologies developed by PSI-supported investigators. You may also request plasmid clones via the PSI Materials Repository . As always, you can nominate targets for PSI investigators to solve. If you’re going to the 2011 American Crystallographic Association meeting (May 28-June 2 in New Orleans) and want to know more about using these PSI products in your own lab, plan on attending my session, “PSI Tools for the Home Lab.” Also, the Structural Biology Knowledgebase will offer workshops at the International Conference of Structural Genomics (May 10-14 in Toronto). Fiscal Year 2010 ended on September 30, 2010. We have now analyzed the overall results for R01 grants, shown in Figures 1-3. Figure 1. Competing R01 applications reviewed (open rectangles) and funded (solid bars) in Fiscal Year 2010. Figure 2. 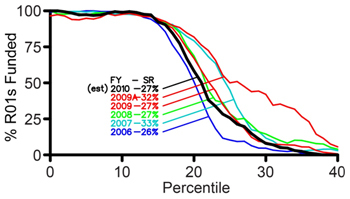 NIGMS competing R01 funding curves for Fiscal Years 2006-2010. The thicker curve (black) corresponds to grants made in Fiscal Year 2010. 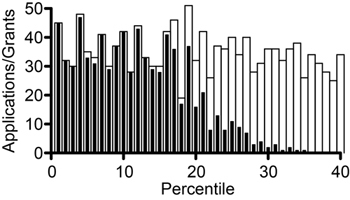 The success rate for R01 applications was 27%, and the midpoint of the funding curve was at approximately the 21st percentile. These parameters are comparable to those for Fiscal Year 2009, excluding awards made with funds from the American Recovery and Reinvestment Act. The total NIGMS expenditures (including both direct and indirect costs) for R01 grants are shown in Figure 3 for Fiscal Year 1996 through Fiscal Year 2010. Figure 3. 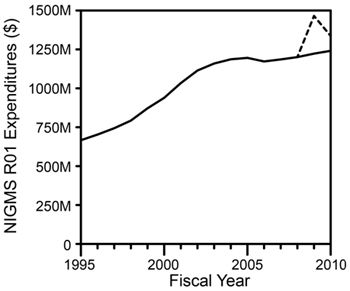 Overall NIGMS expenditures on R01 grants (competing and noncompeting, including supplements) in Fiscal Years 1995-2010. The dotted line shows the impact of awards (including supplements) made with Recovery Act funds. Results are in actual dollars with no correction for inflation. What do we anticipate for the current fiscal year (Fiscal Year 2011)? At this point, no appropriation bill has passed and we are operating under a continuing resolution through March 4, 2011, that funds NIH at Fiscal Year 2010 levels. Because we do not know the final appropriation level, we are not able at this time to estimate reliably the number of competing grants that we will be able to support. We can, however, estimate the number of research project grant applications in the success rate base (correcting for applications that are reviewed twice in the same fiscal year). We predict that this number will be approximately 3,875, an increase of 17% over Fiscal Year 2010. UPDATE: The original post accidentally included a histogram from a previous year. The post now includes the correct Fiscal Year 2010 figure. Registration is now open for the 25th Annual Meeting of the Groups Studying the Structures of AIDS-Related Systems and Their Application to Targeted Drug Design. The meeting will take place March 28-30, 2011, on the NIH campus in Bethesda. Plenary sessions will cover the HIV life cycle, host-pathogen interactions, imaging, latency, viral host recognition and structure-based drug design and resistance. The first two days will also include afternoon poster sessions and breakout discussion groups on the future of NIGMS AIDS research initiatives. Principal investigators, postdoctoral fellows and students are welcome to attend. The meeting is free and open to the public, but advance registration is required. If you’d like to submit a poster presentation, please check the speaker box on the meeting registration page and e-mail me. 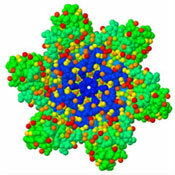 The focus of NIGMS-supported HIV studies has evolved from determining the structures of AIDS-related proteins and developing structure-based drug design techniques to identifying mechanisms of drug resistance and host proteins related to the HIV life cycle. During this special anniversary meeting, the community will have an opportunity to reflect on past accomplishments, describe current advances and develop ideas for future NIGMS AIDS-related funding opportunities. Please visit the meeting Web site for more details about the agenda and confirmed speakers.